Pasta recipes can be used all year round. For the summer try a cold pasta meal that can be eaten on its own or as part of a meal. There are an abundance of different pasta shapes that can be used for pasta salad. Try to pick one of the multi coloured ones or one with an interesting shape that looks attractive when served. Pasta salad is great for picnics. Prepared ahead of time it can be served with sliced meats, green salads and chicken drumsticks. As an alternative to sandwiches pack a portion of pasta salad in a sealable plastic lunch box and take to work or school. Full of vegetables or fruits it is refreshing, healthy and enjoyable. If you are watching your weight use a low fat mayonnaise in the summer pasta salad and if adding meat use a lean version. To prepareCook the pasta in boiling water until just tender (al denti). Drain and leave to cool. Add a spoonful of mayonnaise at a time so that it does not swamp the recipe. Add the cucumber, tomatoes, spring onions, red pepper and prawns. Stir carefully until mixed. Divide into individual containers and seal the lids. If the summer pasta salad is to be prepared for lunch at work or school cook the pasta the night before, drain and store in the fridge so that you only have to add the other ingredients in to morning. Remember to carry a fork or spoon with you to enjoy your salad. If this is for a working lunch, seal a piece of French bread in foil or pack a few crisp breads to enjoy with your lunch. Here are some alternative accompaniments to the pasta. 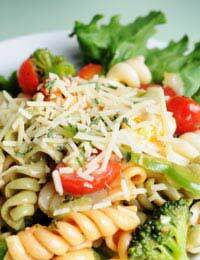 Chicken and sweet corn: Add some chopped chicken and a tablespoon of sweet corn to the pasta and mayonnaise mix. Cheese and pineapple: Diced cheddar cheese and drained pineapple pieces make a tasty alternative. Walnut and stilton: Add chopped walnuts, crumbled stilton and chopped celery to the pasta and mayonnaise. Pork and apple: Diced roast pork and an apple before adding it to the pasta for a delicious lunch. Tuna chunks are very good with pasta and mayonnaise but drain the tuna very well or the liquid will dilute the mayonnaise and make it extremely runny. Invest in a small individual insulated bag if you intend to carry your meal to work. These are easily obtainable in most supermarkets that also sell small blocks that can be frozen in your freezer and will keep the food in your insulated bag cool until lunchtime. There are larger picnic sized bags available for when you have a family day out together. These bags are now more lightweight than the old style cool boxes of old. Most small insulated bags will also have room for a can of drink or even a small bottle of wine for a special treat!